This is a project in which students are challenged to create a musical instrument that uses arrays to store sequences of notes. The array of notes can be played when an input occurs, such as one of the buttons being pressed, or if one or more of the pins is activated. Ideally, the micro:bit should be mounted in some kind of housing, perhaps a guitar shape or a music box. Start by looking at different kinds of musical instruments to get a sense of what kind of shape you might want to build around your micro:bit. 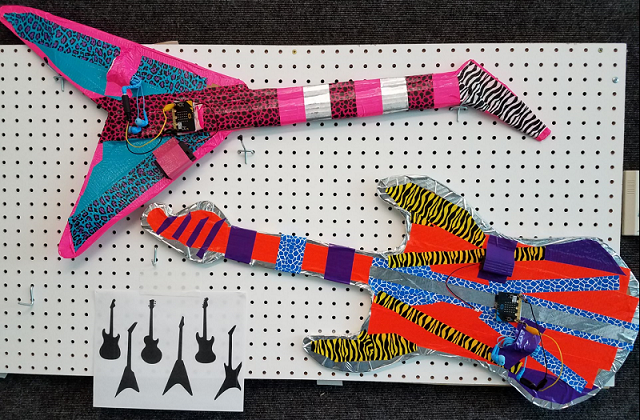 Here are some examples of guitars that were made out of cardboard and colored, patterned duct tape that you can buy in craft stores. This is an example of a project that uses the micro:bit accelerometer to play different tones when the guitar is held and tilted while playing. Pressing the A button will save the current tone to an array. After ten tones, a repeating melody will be performed. Press the B button to clear the array and start over. You can create an array of notes by attaching Music blocks to an array. Musical notes are described in words (e.g., Middle C, High C) but they are actually numbers. You can do Math operations on those numbers to change the pitch of your song. Explain how you decided on your musical instrument. What brainstorming ideas did you come up with? What properties does it share with a real musical instrument? What is unique? Describe the type of array you used (Numbers, Strings, or Notes) and how it functions in your project. What feedback did your beta testers give you? How did that help you improve your musical instrument? 4 = Stores and iterates through each element of the array successfully. 3 = Stores each element of the array successfully. 2 = Array skips values or has other problems with storing and/or retrieving elements. 1 = Array doesn’t work at all or no array present. 3 = Uses an array in a tangential way that is peripheral to function of project and/or program lacks 1 of the required elements. 2 = Array is poorly implemented and/or peripheral to function of project, and/or lacks 2 of the required elements.